I was totally addicted to shooting marker fishing by just watching somebody doing it. It was such a intense fishing experience just by looking at the marker bouncing up and down and getting down to a ready to strike position. To shoot or not to shoot? After seeking advices from some experts and getting the necessary stuffs, I went down to FW3 with Fred straight away to shoot some marker. 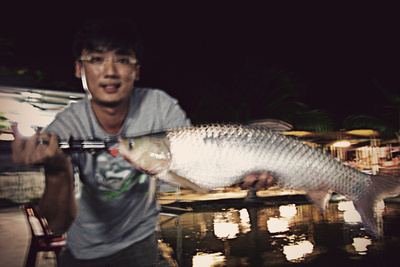 This was my first time shooting marker, first time mixing “khng” bait and first time doing it at night. There were so many challenges but I was so determined to overcome them. It was not long that my marker went up and I decided to shoot. I was on with a very very heavy fish but I lost it due to hook came off. I felt so disappointed but it proved that my khng mix was effective. The night was very quiet with very little actions. Most of the anglers did not get anything. My marker actually slid down below the water surface and I didn’t bother to adjust it. Suddenly the line straightened violently almost pulling my rod into the water, I gave it a good strike and I was on with the fish! It was a good fight on my 4-8lb rod. It turned out to be a decent grass carp. I did it! First time shooting marker, first time mixing khng, first time doing it at night. Priceless. 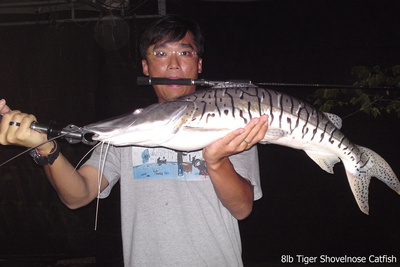 A last minute catch of a beautiful 8lb tiger shovelnose catfish on bait. Put up a decent fight despite efforts in cutting my line under the pump. See what I have found in the Internet. 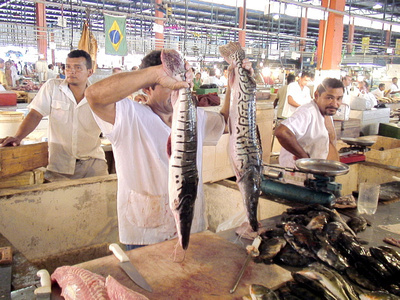 These beautiful fishes are sold in wet markets in Brazil. Wow wow wow!!! 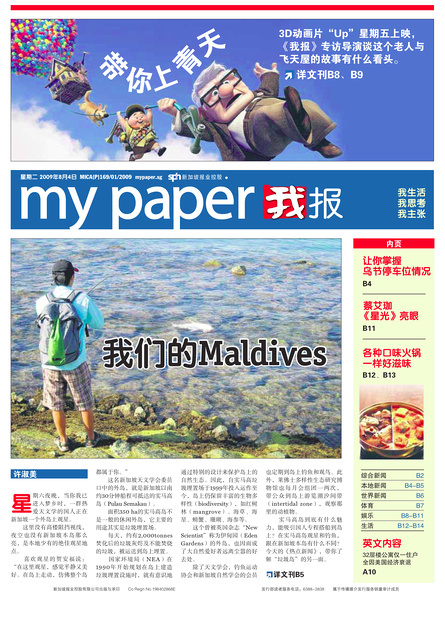 A colleague told me this morning he saw me on newspaper and I was quite shocked. He recognized me because of the unique backpack I carried for work which I apparently used it for fishing sometimes. Nevertheless this was a snapshot of me landing the 12lb queenfish at Pulau Semakau.